Republicans try to delay Hagel confirmation vote. 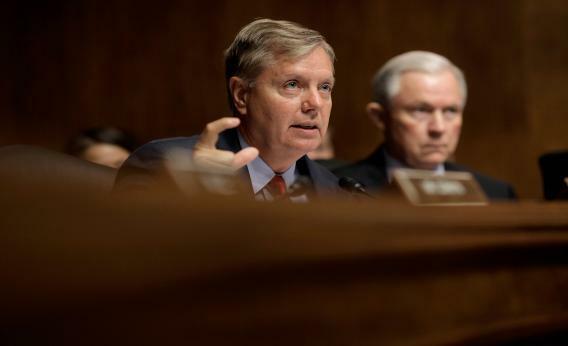 Senate Judiciary Committee member Sen. Lindsey Graham (R-SC) questions U.S. Attorney General Eric Holder on June 12, 2012 as fellow committee member Sen. Jeff Sessions (R-AL) listens on. My colleague Josh Rogin broke this news yesterday: Republicans, lacking the votes to filibuster Chuck Hagel, are instead seeking a delay in Thursday’s committee vote. Democrats have the votes to push Hagel through the committee and onto the floor. But in little-noticed moments last week, Sen. James Inhofe and Sen. Ted Cruz implied that Hagel might have been hiding something by giving the committee the texts of only five speeches from his private sector years, when he’d given hundreds of ‘em. [Sen. Jeff] Sessions also told The Cable that he was waiting for the results of a previously undisclosed investigation by the Republican committee staff into a complaint by a former aide involving another Hagel aide. Three GOP congressional aides confirmed that the committee was looking into the complaint, although there is no evidence that Hagel was directly involved or even was aware of the incident in question. That’s all Rogin—Republicans have not been shouting this from the rooftops, and the rest of the media hasn’t picked up on it. They could drop this on Carl Levin’s lap when the committee opens tomorrow. An unresolved scandal? That could slow this down. He is basically telling Senators they have no right to know if he has been unduly influenced by foreign governments or foreign agents over the last five years. What is he hiding? I’m told several Senators, including McCain, who have previously expressed opposition to a filibuster said privately yesterday that failure to disclose foreign funding information would change their thinking. That’s awfully generous—until and unless he proves that he hasn’t been “unduly influenced” by the enemy, it must be assumed that he has been, even though Hagel hasn’t been accused of saying or doing anything he wasn’t already riffing about in the Senate. (The “Jewish Lobby” quote came during a 2006 interview, when he was considering a presidential bid.) But this, altogether, is the context for a possible move—likely from Lindsey Graham—to object to a Thursday recommendation vote. But not Thursday! Into the quagmire we plod. UPDATE II: Adam Kredo reports that Cruz, savvily, juiced the disclosure story by asking senators to sign a letter demanding a delay. “More than two dozen” had signed it, which is impressive until you realize that 41 are needed to filibuster the nomination.